As a professional stuntman, a film company has hired you to take part in a film. You must shoot seven action scenes covering both land and water. There's even a scene where you must jump the Grand Canyon! 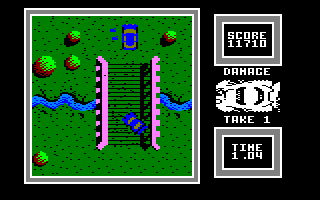 In most of these scenes, other cars or boats will fire at you, and if you are hit by a missile or skid on a puddle, or damage your car too much, another take has to be made – although you receive an 'amazing action' bonus for your efforts. You have three takes per scene, which isn't very generous. The graphics and sound effects are poor and the time limit is quite tight. Memorising the layout of the course on each scene is vital if you're to succeed, but other cars get in the way too much. It's not a very enjoyable game to play. Watch YouTube videos of this game by: ChinnyVision, Xyphoe. NATO has just rolled out its latest tank, and you've been given the job of testing it and taking it into battle. Four levels await you in this mediocre shoot-'em-up. Each level has two parts. The first part involves driving around in your tank and aiming at enemy targets, and the action is viewed from above. This part is not bad, but although your tank is highly manoeuvrable, it can be destroyed with one hit – it's not a very good tank then, is it, NATO? What really lets the game down is the second part, in which you move a set of crosshairs around the screen and shoot targets as they scroll by. This part is excruciatingly difficult, and you'll probably never see the second level without cheating. Other than that, the graphics and sound are quite good, so it's a shame that it's outweighed by some aspects of the gameplay. SuperTed's friend Spot has been kidnapped by Texas Pete. Spot is bundled into Pete's car, and Pete drives off with him in the back. The bear with the red suit and super strength must chase the car and avoid the many hazards left by Pete. 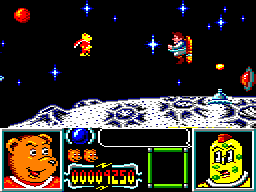 At the end of the first level, he faces Skeleton, and then he flies into outer space where there are more hazards, as well as Texas Pete himself. There are quite a lot of hazards to avoid, even on the easy level, and children (who are the intended audience for this game) will find it too difficult. The graphics are nice and colourful, but the sound effects are poor, and there are only two levels – and I don't mean the difficulty levels. 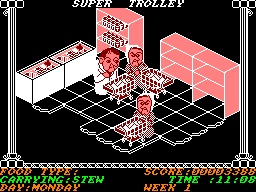 I used to have a part-time job in a grocery store, but it was nowhere near as boring as this excuse for a game. Starting off as a dogsbody in a supermarket, you have to stock up the shelves, and also rescue the occasional stray dog or baby. Keep at it often enough, and you'll be promoted to porter and then manager. The game was developed as a result of a letter to the now disgraced Jimmy Savile's Jim'll Fix It TV show, but sadly, it's extremely boring. There's nothing worse than stocking up the potatoes or whatever, only to be told that you have to stock something else up, ad nauseam. The graphics are OK, but there are hardly any sound effects (although your trolley squeaks) and everything moves so slowly. Race across Europe in a bid to win the Supertrux trophy. Can you reach the finishing line before your time runs out? Starting in London, you steer your truck along the roads, avoiding the other trucks (which all look the same, incidentally) and obstacles which appear, such as roadworks, tyre barriers and puddles which cause your truck to skid. A nice aspect of this game is that at the end of each stage, you can choose one of two routes, so for instance, you can visit France and Spain, or alternatively, travel across Belgium and Germany. The graphics are reasonable and the scrolling is quite fast, but crashing is often unavoidable, which obviously hinders your progress and can be rather frustrating. A dragon called Meka is bringing fear to Wonder Land, so Wonder Boy sets off to Monster Land on a new mission to defeat him. 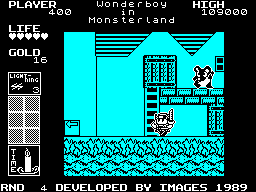 This is a platform game, and Wonder Boy has to kill all sorts of monsters with his sword. Each monster you kill will produce some gold which is used to buy better weapons and armour, spells, or food in the many shops which you can enter during your mission. Unlike its predecessor, the graphics are rather ugly, and the most noticeable thing about them is the almost total lack of colour. There's hardly any sound during the game, although there is a tune on the menu. The gameplay doesn't make up for these deficiencies, though. Watch a YouTube video of this game by: jgonza. I always enjoyed wrestling games because I was a huge fan of the WWF wrestling series (nowadays known as WWE) back in the 1980s, so I was really eager to play this game. To begin with, the graphics are a little blocky but they are smartly designed and they surprisingly resemble the atmosphere of the Wrestlemania matches, with the same wrestlers (yes, Hulk Hogan couldn't be absent from this!) and the crowd shouting and taking photos. The sound is good with some effects besides the crowd noise, while the sprites, although recognisable, definitely lack detail. The animation is very smooth with a high frame rate but the controls are a little awkward, and although there are several moves, it is not very easy to perform them. Also, you can select your wrestler from a choice of four. However, the gameplay has the potential to be far better. You have been invited to a party within a large house, but first of all, you must search the house and find five letters which make up a code. The house has one hundred rooms, and there are dangers lurking in most of them. This is an absolutely terrible game – that much is obvious from the moment you load it. From the loading screen consisting of random lines and flashing colours, to the extremely crude graphics, to the extremely irritating random beeps which play throughout the game, to the snail-like movement of your character, this game has 'awful' written all over it. Even then, I might have felt generous enough to give it at least one mark out of ten, but alas, no – you only have one life! And did I mention that it only works properly on a CPC464 and not on the other models? You are stuck in a maze-like arena full of endlessly generating robots and monsters. Your mission is to collect all of the treasures scattered around. All contact with the nasties drains your energy bar, but there are potions that boost this. 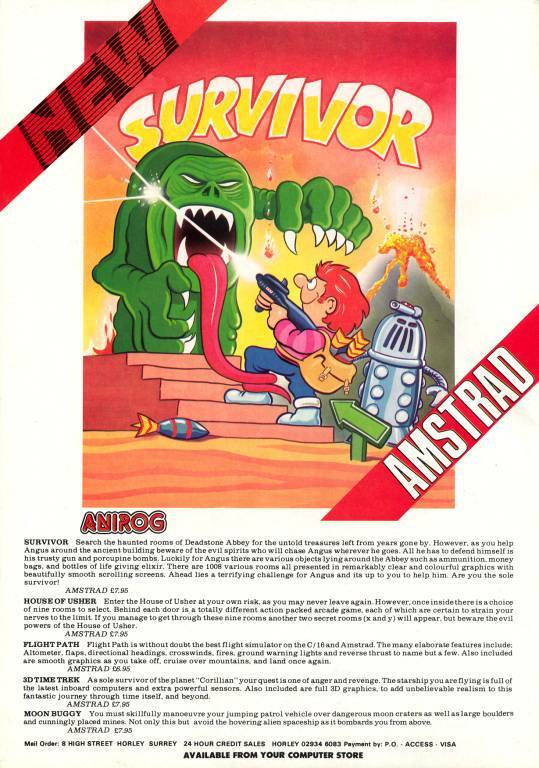 This game shows its age; it was one of the first to be released for the CPC464. An aged game idea with primitive methods of gameplay, simple, blocky graphics and basic effects. On board a spaceship, you are the sole remaining example of a creature that has evolved over one million years. Your aim is to ensure the survival of your race by placing ten pods in the incubators that can be found around the spaceship. Of course, there are other inhabitants and machines on board who will drain your energy, although it can be replenished when you place a pod, or by chasing and eating one of the tiny engineers that wander around – which is both gruesome and hilarious to watch! 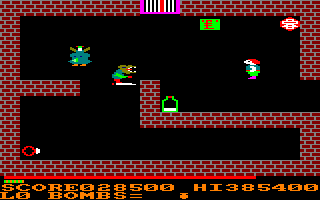 The graphics are very colourful indeed, and while the game can occasionally be awkward – jumping correctly from platform to platform is often frustrating – there is a wide enough variety of locations to keep fans of exploration games interested for some time.